Tag line: "A film of epic portions"
Super Size Me is the award-winning documentary by Morgan Spurlock, a man who woke up one morning and decided to spend an entire month, 30 full days, eating nothing but fast food from McDonalds for breakfast, lunch, and dinner. What effect would such a diet have on his body, he wondered? Gee, let's see if we can't figure that one out! But what elevates Super Size Me to the level of a superior documentary is it takes the story one step further. Spurlock does more than present a video diary of his journey towards self-destruction. Through interviews and with plenty of statistics to back him up, he carries us far beyond the golden arches to reveal a deeper level of greed, showing why it's in the best interest of many corporations to keep large quantities of junk food flowing into our mouths, all at the expense of our waistlines. 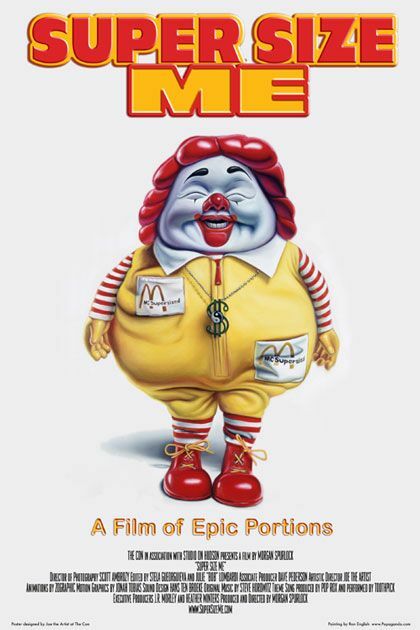 While Morgan Spurlock's personal experiment is indeed a fascinating tale, related here in an entertaining, often humorous way, Super Size Me tackles other disturbing stories as well, all relating to the "fattening up" of America. For example, there's John Robbins, one of the heirs to the Baskin Robbins Ice Cream fortune. Over time, Robbins turned his back on the family business, a direct result of years of poor health stemming from a steady diet of ice cream. Then we have the tragic story of Bruce Howlett, whom we first meet as he's lying on a hospital gurney, preparing to undergo gastric bypass surgery, a procedure that will shrink his stomach to the size of a small apple. Howlett is just one of many obese people who've turned to surgery to help control their weight. What brought him to this desperate state? Well, maybe it was the 2 gallons of cola he used to drink...every single day. Several days after seeing this film, I drove my wife and kids to the local YMCA, where my two sons were taking swimming lessons. Once their classes had ended, both asked if we could stop off for some ice cream sundaes. I suppose so, I said. After all, it was the middle of the summer, and they'd just had a pretty good workout. But as I was standing in line to buy my sundae, I remembered this film. I remembered John Robbins, and poor Bruce Howlett. The employee behind the counter asked me what I wanted. "Just bottled water", I replied. "I'm sorry, sir, we're all out of bottled water". "Thanks a lot, Morgan Spurlock"
I don't fully understand the moral behind the bottled water story. May I implore you to elaborate? Spurlock is an entertaining host. But the messages were too redundant. If he wanted people to think twice before ordering fast food, I suppose he could claim success. It probably served as a decent wake-up call for some folks. But I never felt like a better educated person about food or corporate culture especially since his main experiment was essentially a straw man argument. And I appreciate your take on the film. Thank you for sharing it. You're welcome and thank you. I thought that might have been what you meant but I was overthinking it. And point taken. It's definitely frustrating to run short of alternatives in the most inconvenient times. Ian: No problem. Again, I didn't word the story as well as I could have, so I could understand your confusion.